Christopher Park was constructed 60 years ago and is showing its age. 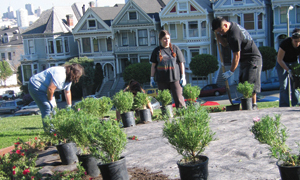 FOCP was created to work with the SF Recreation and Park Dept. (SFRPD) to provide input on the renovated playground design funded by the 2012 Park Bond. The FOCP has identified park improvements beyond the scope of the bond funding. To initiate our fundraising campaign and build community around the park, we created the Where in the World is Christopher Park? Festival.